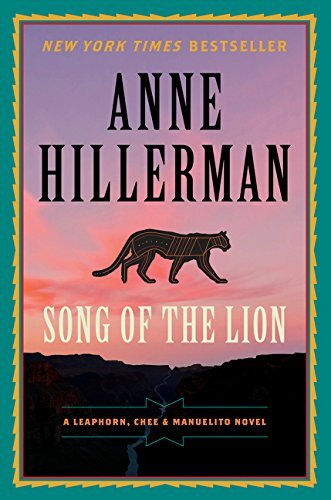 Anne Hillerman’s Song of the Lion follows a path well trodden in cultural police procedurals. Much like the character Arkady Renko in Martin Cruz Smith’s wonderful series, the emplacement is the thing, not the crime, not the endearing and very real policewoman Manuelito. The native people’s environment, the feeling of the true West, the out-of-season trek across the landscape of the Four Corners region imbue this story with its true adventure, its true foredrop—not backdrop—of a crime procedural. Of course, in today’s world of commercial fiction of write-a-book-every-two-years, the author and no doubt editor (named as the excellent Carolyn Marino) are under time constraints leading to silly mistakes which, in the end, do dampen the reader’s enthusiasm for the quality and veracity of the author’s otherwise wonderful grasp of the time, places, and people. “A new smelled added itself . . .” [reviewer’s emphasis] should have been spotted, along with too many others. For some readers such casual mistakes can be misinterpreted for less than Ms. Hillerman’s talent or Harper’s reputation. But to be fair, it is rare to read a book these days without similar mistakes from all the top five publishing houses. Perhaps that is today’s norm, in a world of texting and tweeting, what are a few misspelled or grammatically incorrect words? Maybe it is only the older generation who care. It is difficult to judge the characters’ voices if one has not read the previous two books in the series (or Tony Hillerman’s previous introduction to the main characters). Without that foreknowledge, it is difficult to accurately “hear” the voices and temperament behind the extensive dialogue used in the book. The author’s narrative voice is so much better than her use of dialogue; it is easy to begin page-turning through dialogue, yearning for the author’s voice, much as readers always marveled at her father’s clear descriptions. Has the Hollywood bug been so enthused to create a reliance on dialogue over the author’s better narrative voice? Dialogue for advancing plot is never as effective as good narration. One can only hope that she trust herself more than her characters in the next book. Nevertheless, these petty gripes aside, what is marvelous about the book is that there is tradition here, there is caring here, there is deep understanding here—always truthful. Not just of the Diné people, not merely the cultural landscape (for the land in New Mexico and eastern Arizona does have a cultural empathy all of its own which Ms. Hillerman captures), but also of the pace of the earth there, the feeling that yesterday is today and tomorrow; that matters will resolve and cannot be rushed. In her ability to weave her tale’s threads, alternating perspective, character to character, often in separate chapters, Hillerman is weaving literary cloth all her own, apart from her father. Yes, thankfully, the link to his part of the world is revived here, but her rug is woven to her own design, one that works well, and has lasting appeal—all of her own. Bravo! Many readers may care more about the “procedural” and should not be disappointed. There are carefully laid in clues, the requisite switch-backs, danger, and violence. None of these exciting moments in any way lessen the real worth of the book, but rather also serve as searchlights to reinforce the environment, the very real characterizations, and, in the end, set up the protagonist, Manuelito, for a moment of destiny. Perhaps it could be seen as a moment of inevitability in a locale embedded in not only native American culture, not only in new American reverence for nature, but using a metaphor of the real wild that is, in every sense, stalking the reader, the case, and Manuelito from the very first pages. Song of the Lion is a modern western in every sense and, as such, continues a fine tradition. Ms. Hillerman has the talent and clearly an understanding of the real West and its peoples to further this series—and readers will surely hope she does. Peter Riva is a literary agent and an author of books in two areas: science fictions and African adventure.